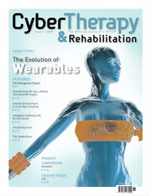 Annual Review of CyberTherapy and Telemedicine (ARCTT – ISSN: 1554-8716) is one of the official journals of the International Association of CyberPsychology, Training, and Rehabilitation (iACToR). 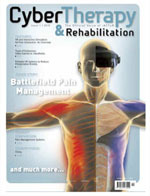 The journal published annually (once per year) by the Interactive Media Institute (IMI) - a 501c3 non profit organization, dedicated to incorporating interdisciplinary researchers from around the world to create, test, and develop clinical protocols for the medical and psychological community - in cooperation with Università Cattolica del Sacro Cuore, hosting and maintaining this web site. Because the articles examine entire subfields in depth, they are written by experienced researchers upon invitation from our Editorial Committee and evaluated through double blind peer review. The guidelines for authors can be found here. There are no fees associated with the publication of invited reviews. iACToR is an international non-profit association designed to promote Virtual Reality and other advanced technologies as adjuncts to more traditional forms of therapy, education, and rehabilitation. Our mission is to bring together top researchers, policy makers, funders, decision-makers and clinicians, pooling collective knowledge to improve the quality, affordability, and availability of existing healthcare. Ultimately, through international collaboration with the most eminent experts in the field, we are working to overcome obstacles and increase access to top-quality healthcare for all citizens. By enhancing public awareness of the possibilities that technology offers, we move toward changing and improving healthcare as it currently exists. * Move healthcare and health promotion/disease prevention to the individual level, providing all citizens the opportunity to become active participants in their own healthcare. 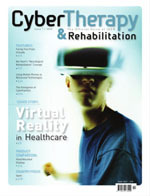 - Annual Review of CyberTherapy and Telemedicine. 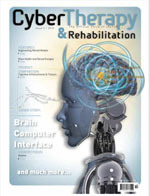 CyberTherapy & Rehabilitation Magazine (C&R), the official voice of the International Association of CyberPsychology, Training & Rehabilitation (iACToR). 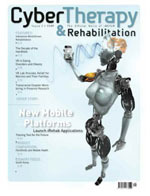 This publication will serve as a catalyst whereby society may rapidly benefit from the remarkable technological revolution that is occurring, with the ultimate aim of improving the quality of today's healthcare, helping to quickly disseminate research results, and ultimately elevating the level of care available for each citizen. ARCTT is a peer-reviewed all-purpose journal covering a wide variety of topics of interest to the mental health, neuroscience, and rehabilitation communities. The mission of ARCTT is to provide systematic, periodic examinations of scholarly advances in the field of CyberTherapy and Telemedicine through original investigations in the telemedicine and cybertherapy areas, novel experimental clinical studies, and critical authoritative reviews. ARCTT is an Open Access journal that does not charge readers or their institutions for access. Because Annual Review papers examine either novel therapeutic methods and trials or a specific clinical application in depth, they are written by experienced researchers upon invitation from our Editorial Board. The editors nevertheless welcome suggestions from our readers. Questions or comments about editorial content or policies should be directed to the editors only. Manuscripts should be submitted in electronic format on CD-Rom or floppy disks as well as on 8½ x11-in. paper (three copies), double-spaced format. Authors should prepare manuscripts according to the Publication Manual of the American Psychological Association (5th Ed.). Original, camera-ready artwork for figures is required. Original color figures can be printed in color at the editors' discretion and provided the author agrees to pay in full the associated production costs; an estimate of these costs is available from the ARCTT production office on request. ARCTT policy prohibits an author from submitting the same manuscript for concurrent consideration by two or more publications. Authors have an obligation to consult journal editors concerning prior publication of any data upon which their article depends. As this journal is a primary journal that publishes original material only, ARCTT policy prohibits as well publication of any manuscript that has already been published in whole or substantial part elsewhere, unless authorized by the journal editors. All the published papers, editorial news and comments, opinions, findings, conclusions, or recommendations in ARCTT are those of the author(s), and do not necessary reflects or constitute the opinions of the Journal, its Publisher, and its editorial staff.